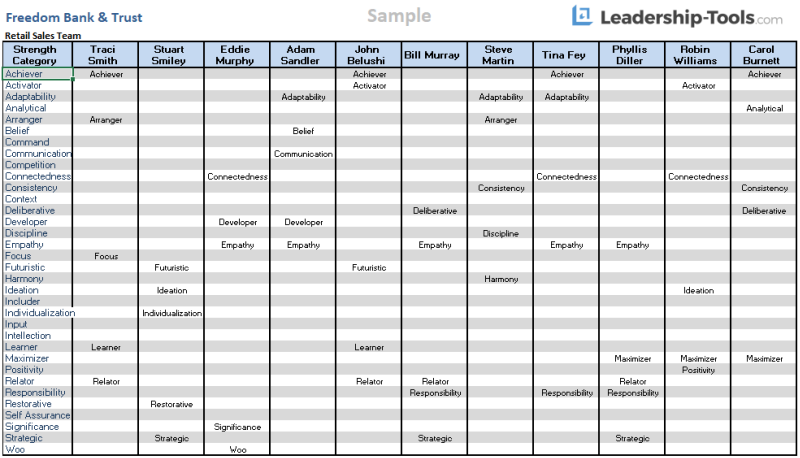 Introducing our free StrengthsFinder Template tool... In 2007, StrengthsFinder 2.0 was published. The book, written by Tom Rath, provides a leadership training resource that helps identify the natural talents of your employees. By focusing on and nurturing the natural talents of every team member, leaders can help team members to develop their talents into key areas of strength, which will make the entire team more effective. The StrengthsFinder assessment is unique because the purpose of the questions asked helps you to identify the areas that you are most likely to enjoy; to discover the areas where your natural talents and special interests reside. When you work in a role that you are naturally suited for, you are more likely to be fully engaged - thereby learning and growing and producing results at a much higher level. Another key aspect to StrengthsFinder is that it encourages leaders to focus on the positive strengths of their team members. Leaders will be able to record the strengths for the entire team using our free StrengthsFinder template! By focusing on the positives, leaders will earn greater respect and credibility in the eyes of their employees. Employees become more motivated to succeed in their role if they know they work for a leader who is committed to their personal and career development. "Put yourself on view. This brings your talents to light." Sadly, too often leaders either ignore their employees or they only advise them when they identify areas needing improvement. This kind of routine negative feedback only serves to tear down the energy and enthusiasm of employees and creates an unhealthy work environment. Leaders who constantly communicate to employees what’s going wrong, or what they need to be doing better, may be thinking they are running a tight ship, but in reality their ship is slowly sinking. Employees need feedback that is fair, real and encouraging. Leaders need to provide feedback that provides energy or “Fuel” to their employees; fuel that motivates; fuel that inspires creativity; fuel that promotes trust and loyalty. Purchase a copy of the #1 Wall Street Journal Best Seller, StrengthsFinder 2.0 by Tom Rath, for each of your team members. Provide a timeline for completing the online assessment. One to two days is optimal The test can be completed in approximately 20 minutes. The user is given only 20 seconds to answer each question - this helps to ensure a more accurate report as results will be based on a person's instinctive responses. Schedule a team meeting one week from the time you hand out the books. Depending on the size of your team, allow 1-2 hours for the meeting to go over everyone’s results. Ask team members to come prepared to talk about their top five strengths identified from the StrengthsFinder assessment. Each team member should read the chapters in the StrengthsFinder 2.0 book that are associated with their top five strengths. For each of their top five strengths, team members should write down their thoughts about whether they relate to the information provided. Does the information give them insight into themselves? If yes, in what way? What information is right on, or perhaps off base? How can they use the information to more successfully maneuver through life going forward? Overall, ask each person to come prepared to provide their thoughts about what they have learned as a result of the information provided in the StrengthsFinder report. Prior to the meeting, collect all of the assessment reports, then use the free StrengthsFinder template tool to record the top five strengths for your entire team. With all of the assessments complete, your StrengthsFinder template in hand, and your team assembled – you are now ready to review the results with your team. Keep in mind that everything that is going to be discussed during this meeting is positive – everyone gets to share their thoughts about their STRENGTHS; areas that they naturally excel in. This should be one of the most positive team meetings you’ll ever lead! Given that you’ll need to manage to your allotted time, you need to keep the conversation moving. There are 34 strength categories. Going from left to right on the StrengthsFinder template, call out the first category and ask each team member who shares that strength to talk briefly about what he/she learned. Discuss with your team members their respective opportunities associated with each strength category, as well as any potential pitfalls. After a brief discussion, move on to the next strength category. If a team member disagrees with some aspect of a strength description, let them know that is okay. The purpose of the exercise is to help people identify their strengths and gain insights about their potential. Some aspects of the description may not relate to every person that shares that specific strength. Keep the conversation positive and move forward. Depending on how many employees you have, you may have categories that are not in any of your team member’s top five. That’s okay too. Although you won’t spend much time talking about those specific categories, you should be able to give a quick 30 second overview of the category. Once you’ve completed the team review, it’s time for a brief summary to explain what your team members should take away from this exercise. People who do not work in their areas of strengths are probably not in the right kind of role. These people tend to stagnate in their career; they burn out, or become disengaged over time. They are typically less happy in their home life as well. In contrast, those people who do work in their areas of strength develop more quickly; they learn and grow their knowledge and skill-set. These people maintain their focus and energy and continue to produce at a high level. In general, this group also experiences a better quality of life outside the workplace. In conclusion, the StrengthsFinder 2.0 assessment is a terrific team building exercise that will help to motive your employees and promote a positive work environment. Unlike many other personality or behavioral assessments, StrengthsFinder is very affordable. In addition, completing the StrengthsFinder assessment yields a high level of insight and actionable feedback for every user. Leaders who choose to invest in their employees, will reap the many benefits – including, improved teamwork, increased production, greater credibility, trust and loyalty in the workplace. 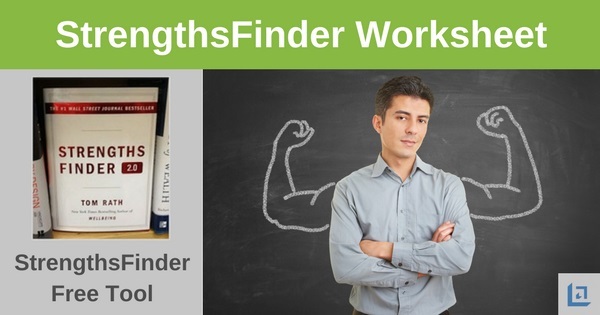 Give StrengthsFinder 2.0 a try – it’s quick and easy to implement. As a leader you will learn a lot about yourself. Your employees will also appreciate your time and interest in their professional development. To download our free StrengthsFinder template, simply subscribe to our free newsletter. You will immediately receive a password that grants access to our entire leadership tools library.